Past the trail register box on the west side of the parking lot, the trail descends a steep slope of slickrock. The bare rock doesn't show any footprints, but just head generally west for a quarter mile until you see a defined sandy trail. Dark, basalt rocks lie scattered across the wonderland before you. These volcanic rocks originated from Boulder Mountain, the flat-topped mountain to the north, and have been carried down by water. Make your way along the rock domes separated by sandy benches for the next half mile. The grade levels out, and the trail continues west descending gradually. Juniper trees dot the landscape, growing out of cracks in the rocks and in sandy patches of cryptobiotic soil. Around 0.8 mile, the trail splits into a lower and upper route. Both offer shade, water, and beautiful scenery. 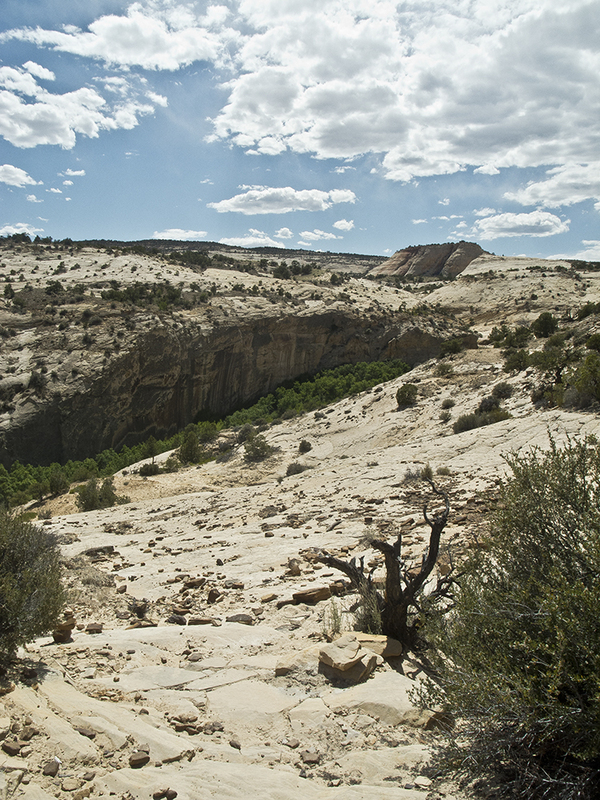 For the lower route, veer left at the junction, and you will end up at the bottom of Upper Calf Creek Falls. 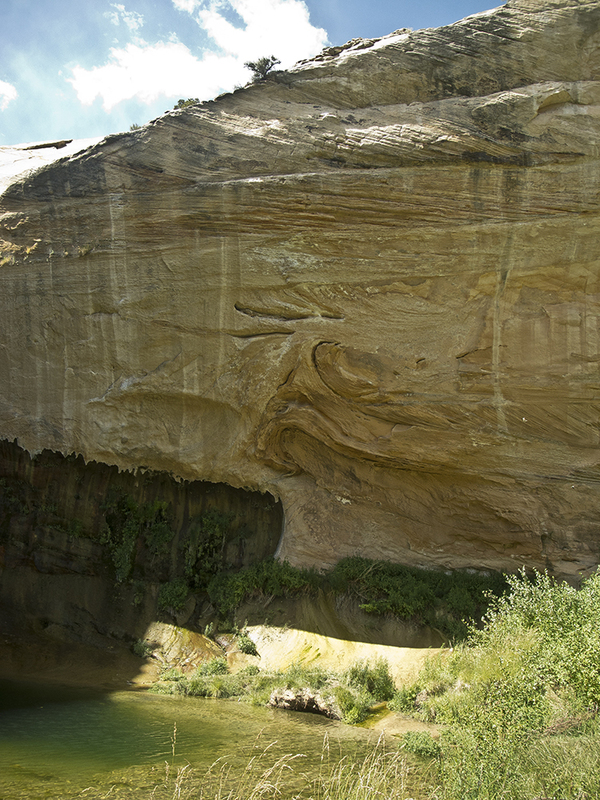 Cairns lead you around a dome of Navajo Sandstone, and you briefly contour along the canyon walls as you head upcreek. Your destination beckons in the near distance—lush cottonwoods line the creek corridor, and the waterfall crests over the top of the cliffs. Drop down to creek level by following the trail to a shady alcove. 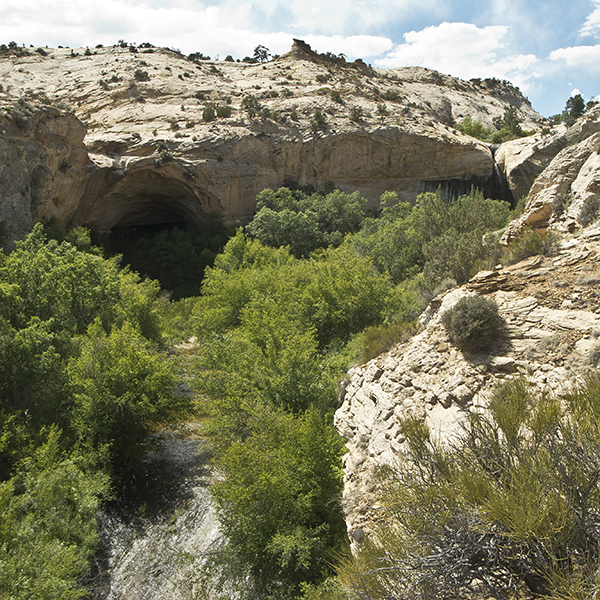 From here, the trail continues through thick vegetation (beware of thorns) and ends at the base of Upper Calf Creek Falls. Water cascades in a thin stream from 88 feet above. Hanging gardens decorate the surrounding amphitheater, and moss grows along small seeps. Enjoy the cool mist blowing from the waterfall, or better yet, take a dip! A marshy area south of the falls offers pockets of shade. To explore the upper section of the falls, return to the trail junction and turn left. You stay high, bending northwest along slickrock and sand slopes. After hiking another 0.25 mile, you reach the lip of the waterfall where it cascades down into the canyon. From there, you can explore upstream as far as you wish. 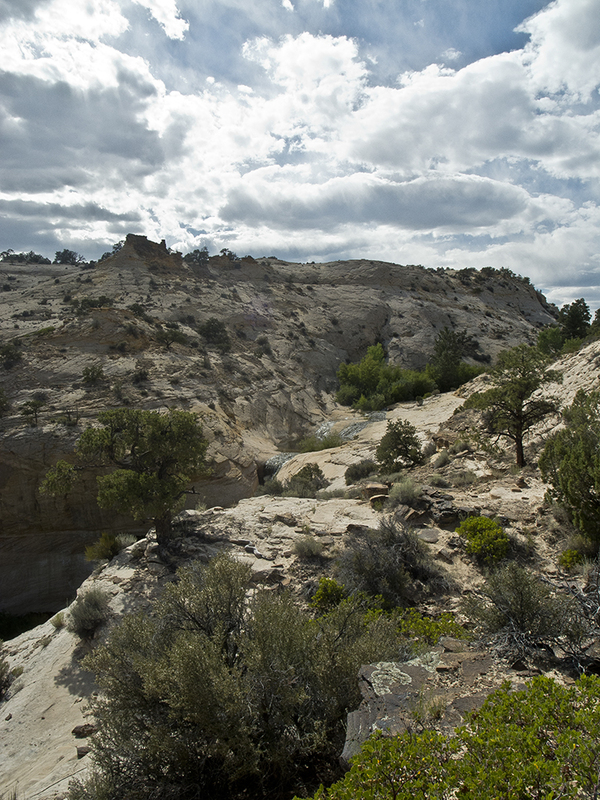 Whichever route you choose, retrace your steps to return to the trailhead. From the junction of UT 12 and Burr Trail Road in Boulder, Utah, head west on UT 12 for about 5.5 miles. The road turns south, climbing to the top of a ridge with immense views of intricate slickrock country. The trailhead can be difficult to find; keep your eyes on the west (right) side of the road for an unmarked dirt spur road just after mile marker 81. Turn right and follow the road 0.25 mile to a looped parking area. No fee – Check the website below for current information. Get 3 new hikes in your inbox every month. In December 2017, President Trump slashed Grand Staircase-Escalante National Monument by half. Keep tabs on monument lands that were stripped of protection. 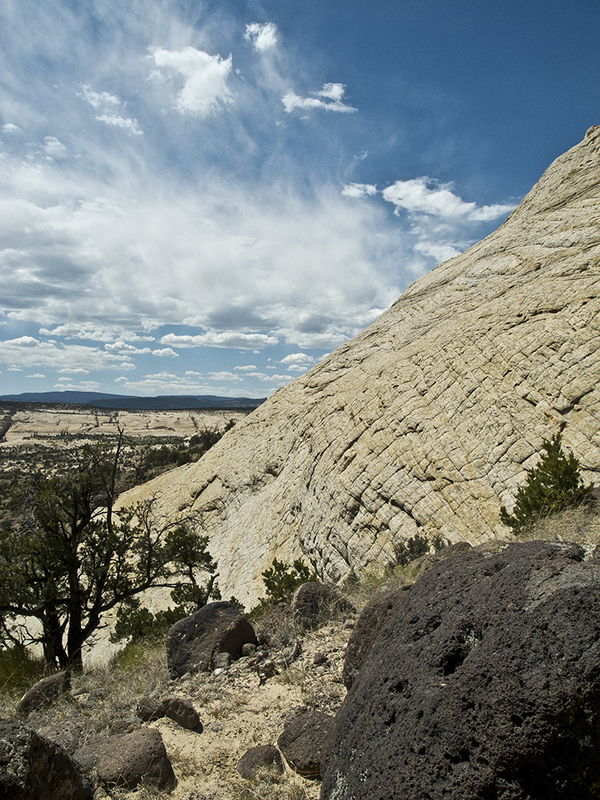 We'll send you emails with opportunities to weigh in on proposed plans and projects that affect Grand Staircase and other public lands across the plateau. Love Grand Staircase? We do to. By giving to the Trust, you're helping win back protections for the monument, supporting on-the-ground work, and advocating for the protection of public lands. Help protect the lands you love to explore! On International Women's Day, learn about some of the artists, scientists, and river runners who made history in the Grand Canyon. Don't let a little snow keep you from exploring the Grand Canyon. Here's everything you need to know for a winter trip to the big ditch. From backpacking, to canyoneering, to rock climbing, find out how you can nab a coveted permit in Zion National Park.